This stage, that abandons Lugo to approach the French Camino, is possibly the most boring stage on the Primitive Way. Pilgrims tread on vast amounts of asphalt on a secondary road, in many areas without protection from road traffic. They have a number of options with regard to choosing the end point of the day. They should plan the route well as there is no excess of accommodation or catering establishments until reaching Melide. There are also no other services. The first is San Román of Retorta, a little over 20 kilometres. 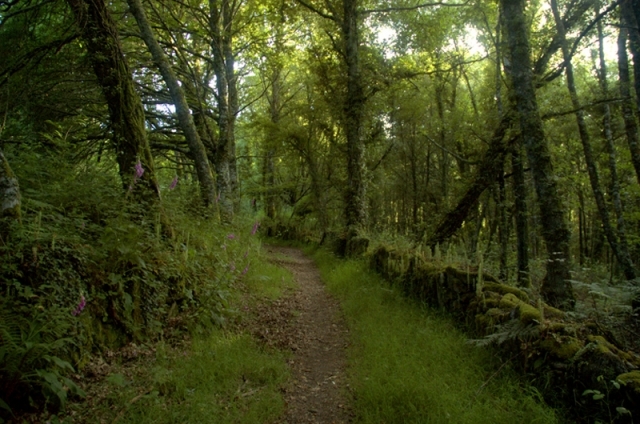 Many hikers choose to continue the Camino for 7 kilometres until reaching Ponte Ferreira. There is even a third option: As Seixas, five kilometres further ahead, where there is a public council albergue and, a rural house/private albergue where they can spend the night. For those in a hurry or for those who prefer to avoid overcrowding, the last two options allow them to shorten the number of stages on the French Way. The Camino continues along the same road-the Rúa de San Pedro-that was taken by pilgrims when they passed below the gateway of the city walls of Lugo on the previous days journey. A little further ahead there is a chemist. Walkers will enter the pedestrian or, semi-pedestrian historic city of Lugo through its cobbled streets. As in Oviedo-where the Primitive way begins-bronze shells indicate the route at the feet of the pilgrims, leading them to the main post office in Lugo. Walkers continue straight ahead and arrive in the monumental square Praza Mayor. It is relatively easy to get lost, not just because the shell signs on the ground are difficult to see, especially in the rain or snow, but also because there are a lack of signposts. The signs on the roman road XIX (that which connects Lugo and Astorga) can confuse walkers who, should look for the scallop shell at the bottom of the Square that indicates the route towards the river Miño. At the first crossroads on this stretch, a shell sign on a wall indicates hikers to take the path to the right. It is poorly maintained and full of weeds but is not easily missed. This path leads to some stairs in an urbanised area and, at this point pilgrims should turn left, it is advisable to pay attention to signs on this stretch. They will see a shell sign, indicating downwards, on the wall of a house. This indicates that they should go down the stairs situated next to the house and pass below the road. From San Lázaro the Camino continues on the road. It is time to climb. The Primitive way in this area is well indicated. Behind Santa Eulalia de Bóveda and San Miguel, the stretch is beautiful but does not last long. Later. Pilgrims enter Guntín. After a climb, a cemetery and the church of A Retorta appear, as do a number of signs. The shop/bar San Román is very near. The public albergue and the private albergue O Cándido are situated at 600 meters. Conoce la nueva zona de descanso, llamada Vending Casa Zapateiro, en San Vicente del Burgo, sin desviarse del camino. Tiene maquina expendedora de snacks y de café además de una pizarra donde escribir los sentimientos que aporta en camino. Esta es la dirección en Google Maps:https://www.google.es/maps/place/Vendin ... 4d-7.64448 y en Facebook también puedes encontrarnos en la página VendingCasaZapateiro. Mucha suerte en el camino. Desde Lugo he hecho alguna vez una variante por Friol y a Sobrado dos Monges para alcanzar el francés por Boimorto con nuevo y buen albergue y Santa Irene... es muy entretenida y bellos paisajes naturales, como ya es habitual por estas latitudes de Sobrado hacia Santa Irene bastante carretera comarcal de poco tráfico y eso si muy tranquila. 2 reviews Distance to Santiago: 100 km. 1 reviews Distance to Santiago: 94 km.